News-Photos-Updates | The Silver Hill Boys and the Secret Railroad Club | Hi Green! Clear Tracks Ahead! 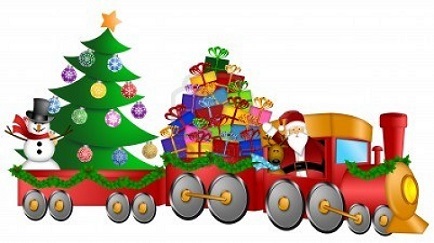 To all friends of “The Silver Hill Boys and the Secret Railroad Club.” To all who enjoy the Silver Hill area at Christmas time visiting and reliving locations in the book where the boys lived their early days around Silver Hill in a wonderful suburban New England town. A couple days ago I received a Christmas card from a grandson of the sweet lady who made Halloween an extra special delight for Silver Hill children. (Pages 88 and 89.) I was drawn to the book and I read it all again last evening. During the read I found myself once again in the 1950’s. Warm, wondrous memories of days that will always be part of me. Thanks….G.B. …Happy Rails! 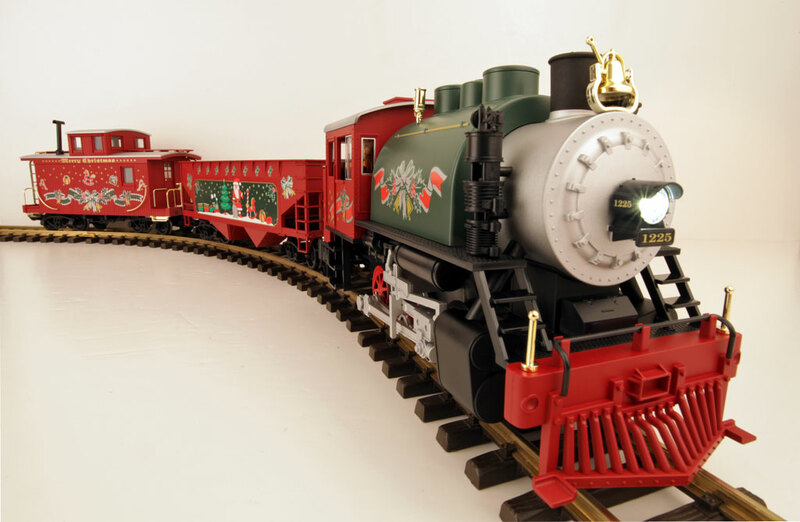 Just like you and The Silver Hill Boys and the Secret Railroad Club, I Love Christmas!!! Always an extra special time of year for The Boys and The Club and for you and me. Sure wish I could be with all of you including, of course, those faithful visitors at Silver Hill this time of year. Reliving the story, retracing many of the locations described in the book. For those of you who have not experienced The Book: Trains and Railroading are the center piece…. However the book brings to life most interesting portions of baseball and Christmas having to do with New England. Some visitors even include trips to a particular cemetery to confirm what is found in the book. I’ve been living, full time, in this beautiful, exciting Southwestern part of the state of New Mexico since July of 2013. There will never be a dull moment here. Not for me. In addition to SW New Mexico studies, field trips and adventures, I spent an enormous amount of time studying lines, blocking, rehearsing for three Theatre Presentations. Each play for a different company. Thankfully they were all very successful. I thoroughly enjoyed most every moment. But, I must say, I’m also delighting in taking, what I feel, is a well deserved break. A New year resolution: Exploring, in depth, the SW NM operations of BNSF, Union Pacific, and Southwest Railroad. I am confident 2015 will be the year! 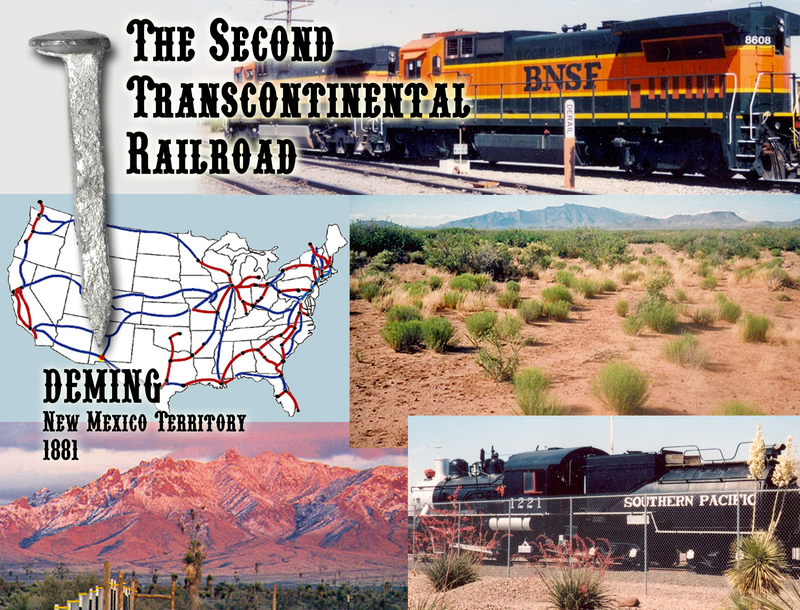 I have been exploring the history of past railroads in this southwestern portion of the state. I plan to share my findings with you in 2015. (Railroads seemed to be everywhere out here at one time. When mining played out, active towns and villages with schools, post offices, hotels, grocery stores faded away. Great fun visiting the remains of these once successful towns. I’ll put together some good information for you in the not too distant future… in 2015. When at Silver Hill, sending a friendly wave to crews running passenger equipment traveling east and west, please send an extra wave from me. (Thanks!) I think you agree…Silver Hill and the Secret Railroad Club is always somewhere in our minds. Yes, it’s been a while. (Actually, too long.) Thankfully, I can assure you all has been well here in Southwest New Mexico. At high peaks most all the time it seems! Union Pacific (having pretty much replaced Southern Pacific in these parts) continues to roll along rather busy tracks paralleling a lot of Interstate 10. As of this writing, we’re down to just three books left. None in Hooksett, NH. The three are out here. Again, I’m very pleased to learn some folks enjoy reading the book, coming back a few months later, reading it again. Sharing the book with children. There are some additions in mind for a second edition, if there is one. I’ve been researching one particular historic event that took place not far from Silver Hill Depot. In fact, Silver Hill Depot is mentioned in this almost incredible event. I was not aware of this story until well after the first edition was in print. 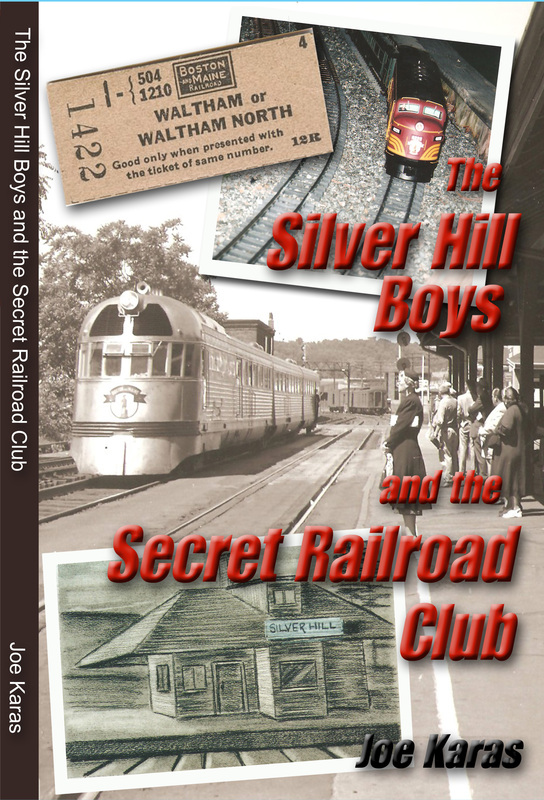 The Silver Hill Boys and the Secret Railroad Club continues to be enjoyed even by those who are not big rail fans. The story seems to captivate some people in various ways. I’m still finding there’s enough content in these pages to satisfy a good number of folks in many more ways than one. Thanks again for sharing your comments…Always! …Keep enjoying HAPPY RAILS !! Christmas!!! The Silver Hill Boys favorite time of year! Just ahead of those hot, humid, hazy, sun filled summer days…and…playing pick-up hockey on North Avenue Pond in the winter. 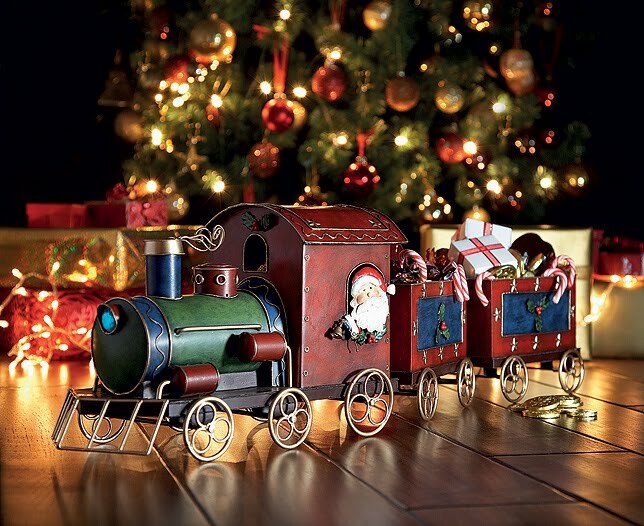 Once again I’m delighted to hear some of you SRRC fans are planning to spend some time at Silver Hill this Christmas season…2013. A growing number of you are making it a tradition having visited during past Christmas seasons….with a copy of The Book in hand. 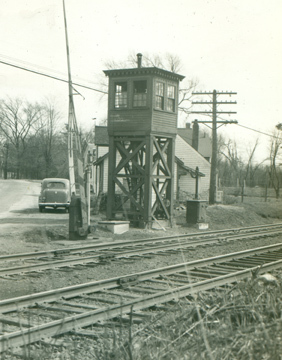 Great fun seeing where the depot was located and, of course, enjoying trains from one of The Boys favorite observation areas, overlooking the tracks from beside the fence, just to the west of Silver Hill Bridge. Enjoy every moment!!! Here it is, November 2013, and here I am… a full time resident of southwest New Mexico! My interest in the southwest American desert began as I watched my first TV western in the 1950s. Majestic mountains, canyons, desert cactus, wide open spaces filled with endless mystery and excitement. Western comic books played a role as well. The Butterfield Trail, Lincoln County War, our own Concord, NH coaches transporting people across the desert. Almost living in the shadow of Cooke’s Canyon, one of the three most dangerous places to travel through during the years between 1850 – 1888. Massacre Valley, the remains of Fort Cummings, so much to explore and study and photograph. I’ll always have special roots in New England, but at last I’m here full time in the desert and I love it. As most all of you know, Silver Hill is always somewhere in my mind. New England memories are deep and more than plentiful. Seventy years in Massachusetts and New Hampshire. Honestly good, precious years! I sold my Derry, NH properties last May 2013 and rode into town out here in July 2013. Southern Pacific trains run beside long portions of Interstate Rt. 10 hauling freight loaded in Los Angeles heading east, returning to Los Angeles along the same basic route. Two long, one short one long crossing into and out of the outskirts of town. I’m living where the Second Transcontinental RR was completed. A ceremonial Silver Spike joined the Southern Pacific and Santa Fe Railroads in 1881. My postcard celebrating this historical event is selling well out here and at RR shows “back east”. Please send an email for your card courtesy of “the Silver Hill Boys and the Secret Railroad Club”. Remember to include your name and address. I am still JosephAKaras@comcast.net. Happy rails to you from New Mexico, U.S.A.
A Look at Lincoln Tower! As many of you know a B&W photo postcard of the elevated gateman’s tower at the top of the Silver Hill grade in South Lincoln, MA is part of the SRRC Classic Postcard Collection. 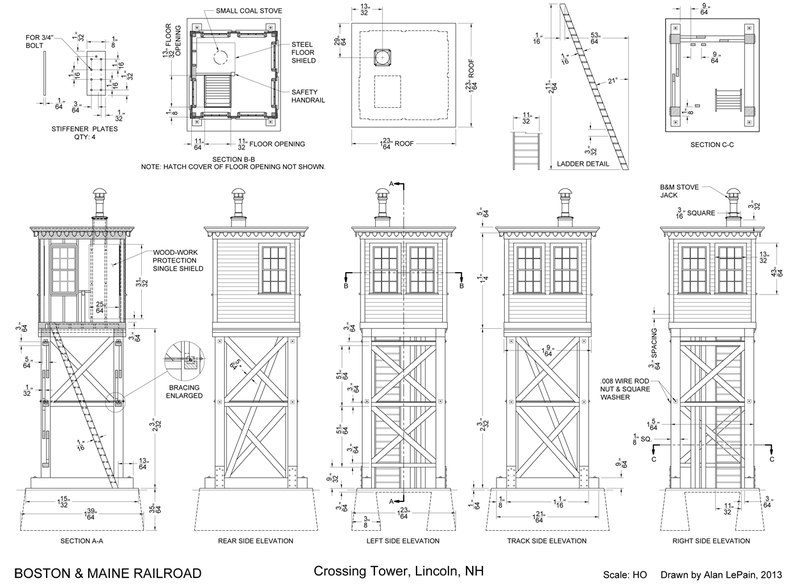 I’m delighted to present the latest HO scale drawings of this historic tower. Those of you modeling the Silver Hill area, the home of the Silver Hill Boys and the Secret Railroad Club, will find these drawings most valuable indeed as you have great fun working to capture the area. What a find, thanks to Honorary SRRC Member Bruce Bowden who recently sent to The Club these excellent drawings. Happy Modeling! Make it Happen ! A fabulous summer 2013 for all you fabulous SRRC Fans including your families and friends. Sincerely, Joe Karas. I bet you knew…BUT, did you know? The center piece of The Silver Hill Boys and the Secret Railroad Club is, of course, railroading. BUT…In addition the book touches on some very interesting history regarding Baseball and Christmas. Touches of ornithology and dendrology. 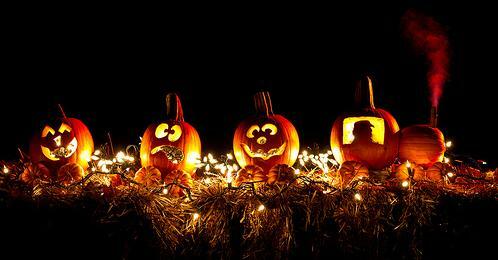 …all of us here in the Secret Railroad Club wish you a Happy Halloween 2012.